Patent litigation in the U.S.? 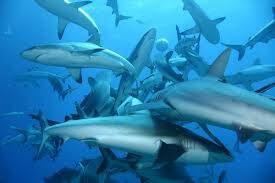 What causes a feeding frenzy? In the undersea world, the smell or sound of wounded prey can attract one shark after another, fueling the carnivores’ aggression. On dry land, analogous signs of weakness inspire patent litigators, especially where software-related technology companies are the quarry. End-users of technology and small companies with scant resources have become popular targets of “patent trolls,” as have larger companies that readily settle for nuisance value. Fighting back successfully—as some recent court rulings show it can be done—can fend off the circling shiver of sharks plaintiffs’ lawyers at least temporarily and perhaps permanently. But doing so is not for the faint of heart or shallow of pockets, a reality that policy makers must keep in mind as patent reform debates evolve. “Settling Feeds Trolls.” Some companies have adopted the posture that consistently fighting back is the best shark repellant. Online software and hardware retailer Newegg has been admirably aggressive. 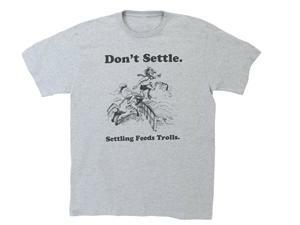 It has even designed a t-shirt that reflects its patent litigation posture. Privately-held and represented in-house by well-spoken (and outspoken) chief legal officer Lee Cheng, Newegg has prevailed in court over patent trolls twice this year already. Presented with a loss in the Eastern District of Texas to patent licensing company Soverain, Newegg didn’t join J.C. Penney, Victoria’s Secret, Zappos and others who settled. It instead appealed to the U.S. Court of Appeals for the Federal Circuit, which in May invalidated Soverain’s online “shopping cart” patent. Soverain then brought on highly-regarded, white-shoe appellate counsel and sought a rehearing. On September 4, the Federal Circuit sustained its holding. This January, the Federal Circuit unanimously, and without comment, affirmed Newegg and Overstock.com’s Eastern District of Texas trial court win over Alcatel-Lucent. That company had been asserting highly ambiguous patents acquired when Bell Labs went out of business. Zappos, Amazon, Sears, and other companies had previously paid over $10 million in licensing fees to Alcatel-Lucent on that patent. Rackspace, a publicly-held, cloud-based IT hosting business, has taken an equally forceful approach. Its general counsel, Alan Shoenbaum, has been a leading voice for patent litigation reform. It has also taken a stand recently in court. After receiving a licensing demand letter from assertion entity Parallel Iron, Rackspace and Parallel Iron apparently agreed not to initiate legal action until 30 days after either party provided written notice. According to Rackspace, Parallel Iron filed suit in March without notice. Rackspace isn’t only defending against the suit; it filed a suit of its own on April 4, alleging breach of contract and seeking invalidation of Parallel Iron’s patent. Larger Corporations Fight Back Too. Lest we create the impression that scrappy smaller companies are the only ones opposing voracious patent litigators, some larger companies, like Hyundai, consistently fight back. Hyundai did so, for instance, in 2010, successfully (with WLF amicus help) defeating a suit brought by Orion IP, one of a constellation of entities controlled by Erich Spangenberg. In fact, Hyundai is back in court against Orion IP (since renamed “Clear with Computers”), seeking Supreme Court certiorari from a Federal Circuit loss. The New York Times‘ owners, along with three other media companies and J.C. Penney, also prevailed in the Northern District of Illinois over the purchaser of a mobile phone app patent. In Helferich Patent Licensing v. The New York Times Co., the judge found that Helferich had exhausted its patent rights by successfully licensing them to the entire cellular handset industry. Another example of active opposition, a decade-long battle involving DaimlerChrysler, Mercedes, and the aforementioned Mr. Spangenberg, came to an end on August 9 with a slam-dunk Federal Circuit ruling in favor of the auto companies. The appeals court ruling arose from suits and counter-suits over several Orion IP and Taurus IP patents. A 2008 WLF Legal Opinion Letter succinctly summarizes the suits and the lower court rulings. The Federal Circuit affirmed on all but one point. Importantly the court upheld the trial judge’s imposition of attorneys’ fees for bad faith and evidentiary sanctions for witness tampering against Orion IP and Taurus IP. A Costly Deterrent. Considering the high cost of defending a patent suit (reportedly $650,000+), those who don’t readily settle should be applauded, though it’s understandable why so many troll targets do acquiesce. Rackspace asserts that its legal defense costs have risen 500% since 2010. One can only imagine the total amount of the attorneys’ fees in the Daimler/Mercedes litigation, of which the $1.64 million Orion IP and Taurus IP had to pay was likely a mere fraction. Targets of abusive patent litigation are encouraged that policymakers are examining a range of reform proposals this year, some of which may diminish the fear that resisting lawsuits is futile. In the meantime, judges have and should utilize their statutory and inherent powers to punish frivolous patent litigators and unlawful litigation tactics.